U.S. Routes 41 and 129 run concurrently through the center of Jasper. US 41 continues northwest to Jennings and then into Georgia, and southeast to White Springs, while US 129 runs north to Statenville, Georgia and south to Live Oak. Interstate 75 passes close to Jasper, with access from Exit 451 (US 129) 5 miles (8 km) south of town, and from Exit 460 (Florida State Road 6) 7 miles (11 km) west of town. According to the U.S. Census Bureau, Jasper has an area of 2.3 square miles (5.9 km2), all of it land. Jasper is believed to rest on land originally thought to be the site of the Miccosukee (Mikasukis) people, a subtribe of the Seminole nation. The 1823 Treaty of Moultrie bought the Indian lands, and the population was required to move southeast of the Suwannee River. This allowed white settlers to move into the area. A suspected Native burial mound is located at Baisden Swamp (named after Josiah Baisden) just on the outskirts of Jasper. Six miles north of Jasper along the Alapaha River an established Native village called Halata-Micco (Hala-at-a-Mico) (named for Chief Billy Bowlegs of the Seminole, who may have resided there) once stood. Chief Bowlegs signed the Treaty of Paynes Landing (1832) at Hola-at-a-Mico, his "X" mark (aka Billy Bowlegs) establishing the type of Native inhabiting the area where artifacts of pottery, fishing spear points, and arrowheads are often found. The early history and specific makeup of Jasper is rather vague except for scant records that survived several courthouse fires in the late 1800s. What we do know is that the original town was built about a mile south of its current location, near the site of the present day Hamilton Correctional Institution. The original courthouse and a stockade stood where Evergreen Cemetery is located. The citizens fought Seminole raiding parties throughout the early periods, the last Seminole War ending in 1858. In 1861 the Civil War came to Jasper. The Jasper Blues ("I" Company 2nd Infantry CSA) was created from Jasper and county citizens. The unit rendezvoused west of Jacksonville and were shipped by train to Virginia, arriving on the day of the First Battle of Manassas. They were eventually made a part of the First Corps (Stonewall Jackson's) of the Army of Northern Virginia led by General Robert E. Lee. A school in Jasper was named in Lee's honor and is occupied today by the County School Board Offices. In 1865 the Savannah, Florida, and Western railway was completed, and a depot was built about a mile north of the town center. Businesses and homes migrated toward the railroad, and eventually the current town was established along that line. 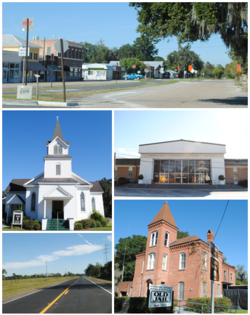 The town grew in earnest between 1890 and 1930 with a rich trade in turpentine, tobacco, cotton, and pine lumber. Jasper reached its pinnacle in the 1920s with a booming population of over 2,000. Most of Jasper's present buildings were built during this 40-year period. Since the 1920s Jasper has seen many economic changes. The leading cotton industry gave way to the turpentine industry, turpentine to lumber, lumber to tobacco, and finally tobacco to phosphate mining. The completion of Interstate 75 in the late 1950s caused further decline as tourists and shipping bypassed the town. In 2002 town officials extended the city limits and infrastructure to the intersection of US 129 and Interstate 75, and built infrastructure (water and sewer) with the help of county officials to the Hamilton County Industrial Park along US 41 in order to encourage economic growth and development. Since that time several new businesses have moved into the area, and the new high school has been built along the route. The large jump in population between 2000 (1,780) and 2010 (4,546) was due to the incorporation of land containing the Hamilton County Correctional Facility into the city limits. The first settlement in Hamilton County was called Micco Town or more accurately Hala-at-aha Micco which is interpreted as "Chief of the Miccosukee"; therefore, it is strongly believed to have been the home of Chief Billy Bowlegs who signed the Treaty of Moultrie, 1823. As of the census of 2000, there were 1,780 people, 742 households, and 488 families residing in the city. The population density was 911.2 people per square mile (352.4/km²). There were 878 housing units at an average density of 449.4 per square mile (173.8/km²). The racial makeup of the city was 52.25% White, 45.67% African American, 0.06% Native American, 0.28% Asian, 0.73% from other races, and 1.01% from two or more races. Hispanic or Latino of any race were 3.09% of the population. There were 742 households out of which 28.4% had children under the age of 18 living with them, 37.7% were married couples living together, 23.5% had a female householder with no husband present, and 34.2% were non-families. 31.5% of all households were made up of individuals and 15.0% had someone living alone who was 65 years of age or older. The average household size was 2.40 and the average family size was 3.01. In the city, the population was spread out with 29.3% under the age of 18, 8.3% from 18 to 24, 23.3% from 25 to 44, 22.5% from 45 to 64, and 16.6% who were 65 years of age or older. The median age was 35 years. For every 100 females, there were 74.3 males. For every 100 females age 18 and over, there were 69.5 males. The median income for a household in the city was $19,018, and the median income for a family was $23,664. Males had a median income of $30,938 versus $17,244 for females. The per capita income for the city was $12,844. About 30.5% of families and 37.4% of the population were below the poverty line, including 56.5% of those under age 18 and 18.7% of those age 65 or over. The Hamilton County School District operates the public schools serving Jasper, Hamilton County Elementary School and Hamilton County High School, both in an unincorporated area of the county. Central Hamilton Elementary School in Jasper previously served the city. It was consolidated into a new elementary school, Hamilton County Elementary School, located in an unincorporated area south of Jasper. Its opening is scheduled for August 2017. The Suwannee River Regional Library System operates the Jasper Public Library (Virginia B. Chandler Public Library) in Jasper. ^ "Geographic Identifiers: 2010 Demographic Profile Data (G001): Jasper city, Florida". American Factfinder. U.S. Census Bureau. Retrieved April 25, 2017. ^ Home Archived 2017-04-08 at the Wayback Machine. Central Hamilton Elementary School. Retrieved on April 8, 2017. ^ Taylor, Joyce Marie (2014-06-12). "Hamilton: New site chosen for consolidated elementary school". Suwannee Democrat. Retrieved 2017-04-08. ^ "Hamilton County set to break ground on new elementary school". WCTV. 2016-06-27. Retrieved 2017-04-08. "The groundbreaking ceremony will take place at 5686 U.S. Hwy 129 South in Jasper." ^ "Hamilton: Culpepper/Gray selected to construct new elementary school". Suwannee Democrat. 2015-07-27. Retrieved 2017-04-08. ^ Home page. Virginia B. Chandler Public Library. Retrieved on April 8, 2017. "Jasper Public Library 311 Hatley Street NE Jasper, FL 32052"
Wikimedia Commons has media related to Jasper, Florida. This page was last edited on 23 August 2018, at 19:48 (UTC).